Had a chance to paint this beauty today, a female Spotted Orbweaver. 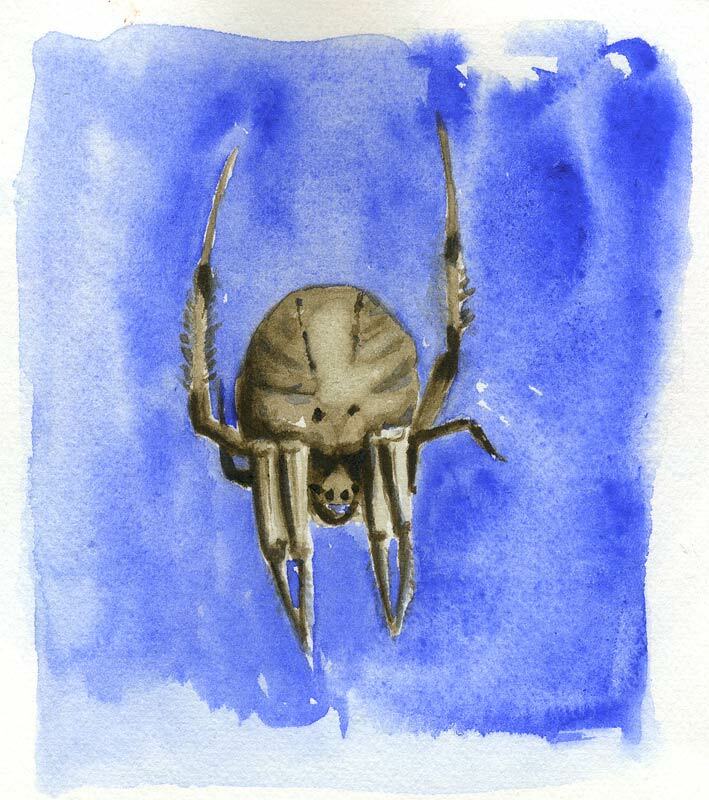 She was ENORMOUS and had built her web low to the ground, next to a perfect sketching rock. Sitting there, I was looking up at the spider, so she is a little foreshortened. I only had to stand up to examine her closely for details. From my rock a few feet away, the web was effectively invisible, so I was painting a spider suspended against a perfect cobalt sky. She obligingly hung there for half an hour, then I looked up: no more spider! She ran up the web and settled high in the tree, in much the same position as shown here. ‘Tis the season, obviously. Love when the giant spiders come out! It was broiling hot out there, but so worth it. Raw umber and PB28 cobalt blue, about 3″ x 3.5″ on Fabriano Cold Press press. Painted in my sketchbook. Here’s more about the creature if you’re interested: Spotted Orb Weavers.